This is why subjectively, and soulfully, I went to visit Carlos and his partner and manager, architect Albert Latorre, at their Miami studio. 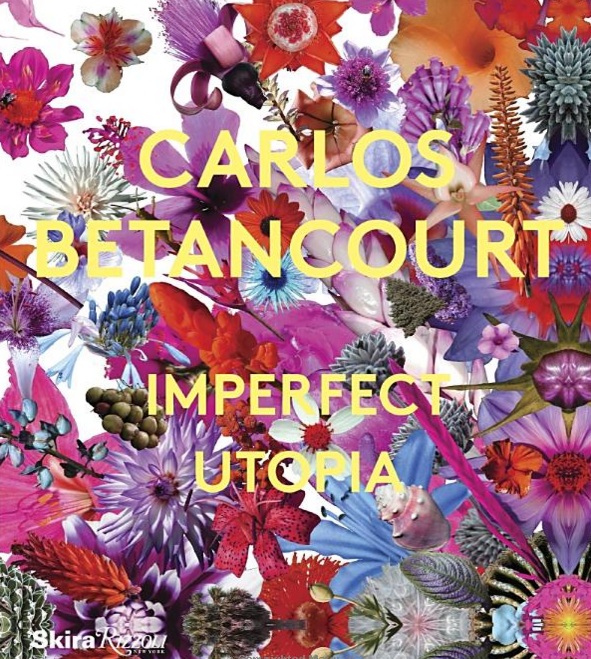 In part, the reason of my visit had a lot to do with the release of Carlos’s new lush, hard-cover coffee table book “Imperfect Utopia,” published by Rizzoli/Skira about a month ago. This exuberant volume explores Carlos’s 25-year-old career with more than 250 images and texts by art critic Paul Laster, art history professor Robert Farris Thompson and United States Inaugural Poet, Richard Blanco. The other reason was because I honestly wanted to peek inside the fascinating space of Carlos, which from pictures I had seen looked as dense and tropical as his native Puerto Rico rainforest of “El Yunque”, which is brilliantly documented in his book. Everything in Carlos’s work is rooted in the idea of memories, beauty and nature. Consummate dexterity in many different mediums including photography, collage, painting, assemblage and sculpture have allowed Carlos to develop his very own visual language which is as vast as the amount of colors, symbols and materials that he uses. Being the child of exiled Cuban immigrants who kept on moving, Carlos was born in San Juan and then settled in Miami when he was about thirteen. His never-ending quest for turning memories into reality started then. He talks about a term he has coined: “Fracturism” his conduit to assemble the fractured pieces of his many cultural identities, languages and histories. While going through the visual explosion of his book, where each page seemed to contain a thousand stories, I can’t keep my eyes still and my gaze wanders in amazement. We are surrounded by large scale collages, sculptures, photographs, books, trinkets, objects – somehow in perfect order and great style even though they could have created a cacophony of massive proportions. As he continues walking me through the book, I have an exalted feeling of a strange similarity between print and reality. In a surrealist state, I could have jumped inside and outside of that book and not feel the difference. Extensive cross-references to color symbolism in literature, religion and popular culture are also abundant in his work. For example, red, which is quite present, indicates energy, desire, war and power. Blue-purple appears as much and comes from the Yoruba tradition that believes “evil can’t cross” as mentioned in Robert Farris Thompson’s seminal book on the art history of the Black Americas “Flash of the Spirit”. Gold, which implies wealth and status in almost every country, dazzles in many of his pieces, mostly used to indicate “magical properties”.